Nothing beats experience when it comes to business and providing a service to customers. The longer a company are operating the more experience they gain and when a customer knows that they are dealing with someone that has many years’ behind them in their field of expertise, they feel that bit more at ease than they would if it was someone that has not been in business as long. This is particularly true when it comes to sales as people place a lot of trust in who they are dealing with and who can blame them as the customer is the one parting with the money. The buyer feels the need to be at ease and familiarity certainly helps in that respect. That is why for this month’s edition of Irish Trucker, we profile a long serving business and speak to its proprietor about what makes a good sales man. Victor Armstrong has been running his own business for the past 30 years. Having established Armstrong Commercials alongside his wife Sylvia in Ballymoney, Co Antrim, they have worked hard over the years to build their customer base, many of who provide them with repeat custom. Victor’s customer base spreads across the 32 counties and indeed revealed that the majority of his customers are located in the south of Ireland. 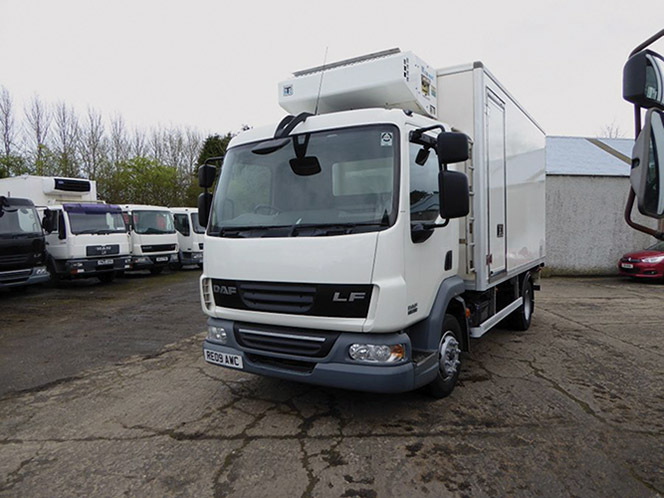 Fridges and freezers, meat railers, livestock trucks, curtainsider boxes and flats, rigids and vans are just some of the vehicles stocked by Armstrong Commercials. “I would say that about 80% of my customers would be down south. I specialise mainly in refrigerated temperature controlled trucks and I would also deal in cattle boxes as well as other types of trucks. “We specialise in ex PLC contract lease maintained refrigerated vehicles, light, medium, and heavy duty trucks with service histories. “We are able to get the help you need for truck financing, HGV finance etc. We can set you up with any kind of truck whether you need stock or manufactured for your special needs. Victor added that he has a massive repeat customer base and the reason for this is that he provides a very reliable and efficient service. “There would be a lot of repeat custom alright. I try to provide as good as service as possible and be competitive with my prices, which is essential these days. “Most of the trucks that I sell would come in from the mainland U.K. I have built up quite an extensive network of contacts over the years and I would be very well known in the industry. One conscious decision that Victor made early in the business has stood to him over the years and that is who he deals with. Victor stocks a wide range of vehicles at any given time, but as stated through his network of contacts, he can source whatever the customer wants and needs. Even when they are unsure of what they want, the experienced dealer is there to offer advice and what might best suit their needs. Armstrong Commercials’ sales covers a wide range of industries meaning they are not relying on the one sector for survival. “Most of our sales would be for customers involved in the food, hospitality, agricultural, transport and retail industries, so there is quite a broad range there to cover. “We are very busy at the moment and certainly having such a broad range of customers does help. I would like to thank them all for all their years’ services and hopefully we can do business for another few years at least. I’m 71 now, but I enjoy getting out and meeting people. I’m not considering retirement just yet,” he joked.